Believing Study - Seek ye out the book of the Lord, and read. In Genesis 24 we read that Isaac met his wife when he went out in a field to meditate. This is the first time meditation is mentioned in the Bible. Today, we are always carrying around a device that gives us instantaneous distraction and entertainment or work no matter where we go. Meditation is practically impossible because we choose to be distracted rather than to be alone with our own thoughts for more than two minutes. I wonder how many blessings and good things God would have for us are lost because we don’t mediate. Author BrandonPosted on March 15, 2011 July 26, 2018 Categories Devotional7 Comments on On my wall is a page. 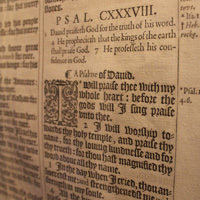 This is a WordPress blog, and I have it running here (for example: Psalm 138:2; Ps 12:6-7). It only takes one line of code to add it to any web page. Enjoy.